They say a picture is worth a thousand words, so why not explore the exciting city of London through 10 amazing photographs? Below are some of the best, hand picked, photographs of England’s fantastic capital city found on Flickr. A compilation of 4 photographs taken immediately after each other showing the progression of the bus. 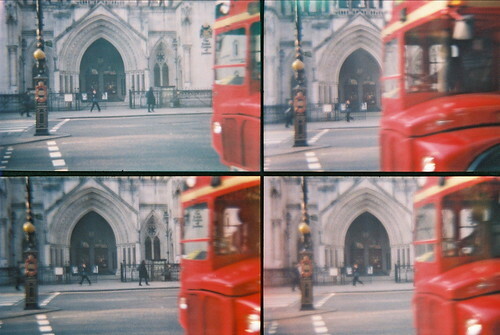 This artistic photograph captures one of the iconic red buses commonly seen across London. The quick shutter speed used to capture 4 continuous shots, allows for a wonderful development in the image, providing a very creative result. A vibrant photo of Big Ben taken from below. Big Ben is part of the Parliament buildings located in central London and is located right next to a tube station, providing easy access for tourists. This popular site is captured wonderfully from an unusual angle in this colourful and exciting photograph. The enthralling fireworks in the centre of London at New Year. 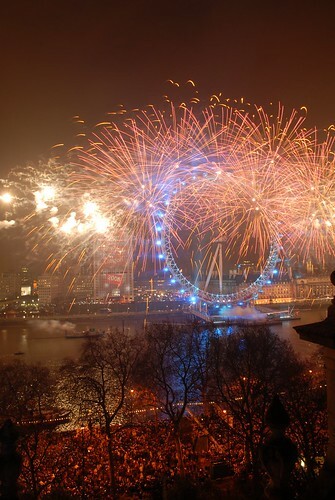 Every New Year’s Eve crowds flock to London to enjoy a firework extravaganza. Here you can see the large amount of people, bathed in a warm glow alongside the River Thames enjoying the spectacular view across from the famous London Eye. The amazing opening ceremony at the 2012 Olympics, London. 2012 saw London host the Olympics and this picture was taken at the opening ceremony in late July. This amazing photograph captures the Olympic rings being artistically unveiled in front of thousands of people. Truly a once in a lifetime experience. 5. Doctor Who Phone Box? A bright blue telephone box! 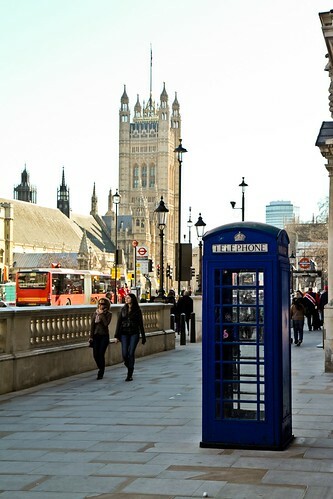 The telephone boxes situated across London are national icons, but are usually bright red. This unique blue box is rumoured to be connected to the famous British fictional character ‘Doctor Who’ who travels through time and space in an old blue police box. Travelling on the tube on the London underground. What makes this photograph so striking is the brilliant perspective down the tube carriage. 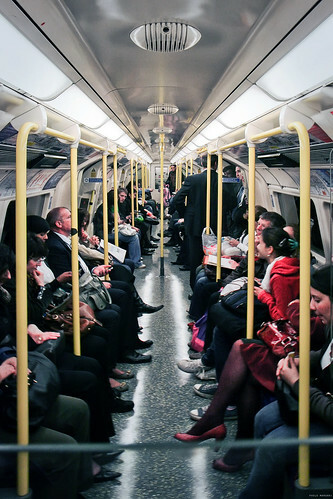 The photographer has managed to make the usually mundane journey, which is an everyday London sight, interesting with a uniformity of workers wedged in a long snake-like column between the rails. Tower Bridge photographed at dusk. 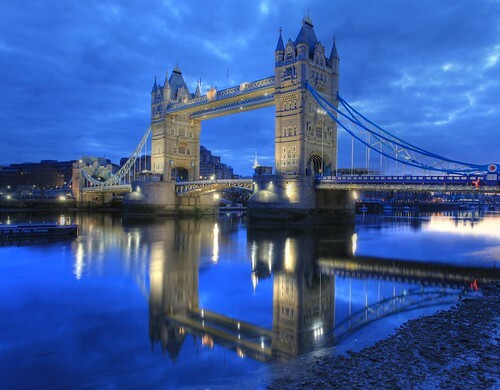 Tower Bridge, often mistaken for London Bridge, is situated along the River Thames. It is a bridge that can open for boats to pass under and is captured beautifully here. The various shades of blue are relaxing yet vibrant, and the reflection of the bridge in the river truly makes for a majestic depiction of London. 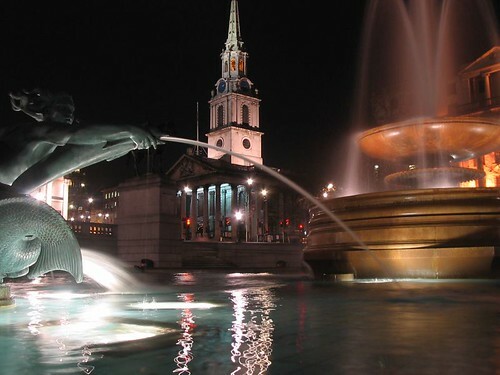 Taken at night, this photograph captures the stunning fountain, located in Trafalgar Square, elegantly lit up. A favourite tourist site by day and a romantic spot by night, the wonderful statue and fountain are peaceful and a must-see while in the country’s capital city. Hyde Park is one of the largest parks in central London and is undoubtedly the most famous. While it is used for large events and concerts, it is also a wonderful spot to picnic, play games, sun bathe (if you’re lucky enough to catch one of the rare sunny days!) and watch the sunset over the superb lake as seen above. The fading sun and the pink clouds reflected in the water, with the trees silhouetted on the horizon show just how beautiful the park can be. 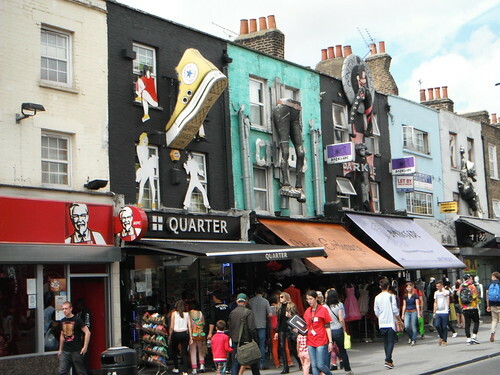 Some of the shops located in Camden Market. Camden market is famed for its rock and roll atmosphere with many tattoo parlours, market stalls, and punters eager to barter and snap up a bargain. The grunge culture of Camden is captured perfectly in this amazing photograph picturing the unusual wall murals, signs and market stalls. Where else could you find a giant boot sticking out of a wall high up in the air? London is an exciting city with a buzzing atmosphere. Above are just 10 photographs capturing the beautiful city, but there are many more out there, especially on Flickr. Why not check them out and experience a bit of the city for yourself without having to leave the comfort of your home? Image Credits: Photo monkey, apdk, jtlondon, shimelle, Giorgio Badaini, Paolo Margari, Anirudh Koul, frankdasilva, curiouslypersistent, and kmoliver.